Happy Secular Winter Holiday 2006! Is Six Years the Equivalent of a Geologic Era? Bird Returns for Fall Break? Lift weights at least 3 times a week. 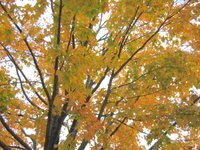 This is the second appearance on this blog of this resolution, but it's slightly more ambitious than the once a month goal set in 2004. Take vitamins at least 5 times a week, especially the vitamin D and calcium. Again, I don't think once a month is very helpful. Practice guitar at least 3 times at week. It's kind of sad, in a way, that I have to make this a resolution, because this is an activity I truly enjoy. Try out a new recipe at least once at month. If I made this more ambitious, I might have to alter resolution #1. I got several new cookbooks for Christmas, so, in theory, this should be easy. Buy more earrings in 2007. I've got to have at least one resolution I'll be guaranteed not to break. One thing that I left off from my post covering Christmas Eve is that my parents gave me a DVD of Buckaroo Banzai, from my Amazon wishlist. My Dad, AE and I watched it that night, since I had not seen in it at least a decade and I was eager to watch it again. It is one of the few movies that I've seen ten times or so. I'm not sure that AE agreed that it is one of the greatest movies ever made, but I'm confident that she'll only need to watch it a few more times. I had Monday and Friday off, since they were Duke holidays, but I had decided to work Tuesday through Thursday as an experiment. When I worked for IBM, I had to use up all my vacation at the end of the year, because the days didn't roll over. Now I have the opportunity to save up to two year's worth. Now that I've tried it, I'm not sure it's worth saving the three days. There's something to be said for having a whole week off and getting plenty of sleep each day, even if I would have had to handle a few pages during my time off. The cafeterias on campus weren't open either, so I had no reason to go outside at lunchtime, since I just had leftovers to heat up in the microwave. At least I tried it. Tuesday night, my parents watched One Flew Over the Cuckoo's Nest. I thought it was an interesting movie and some parts are very funny. One startling thing was that it actually shared two cast members with Buckaroo Banzai, Christopher Lloyd and Vincent Schiavelli. I can't think of anything remarkable that happened on Wednesday. Thursday, after work, my dad and I went to Tonali, which had been recommended by AJ. Based on his recommendation, I even recommended it to numerous people without having actually gone there myself. 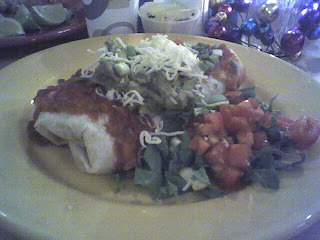 The owner/chef was the sous chef at Four Square and it serves unusual Mexican fare. Unlike Four Square, the prices are inexpensive. They do not have any sort of liquor license yet, which may be a concern to some. 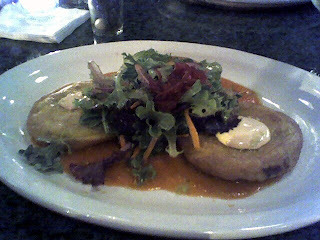 I had some mashed potato pancakes with some greens, which were good. My dad had a paella special, which I thought was very good. For dessert, we shared dulce de leche creme brulee, which was fantastic. 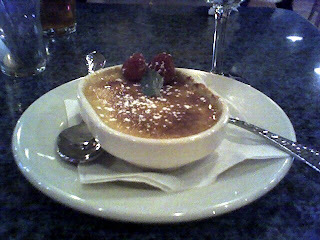 It was easily the best creme brulee I've ever eaten. Their menu changes every week, so I look forward to trying many other dishes in the future. 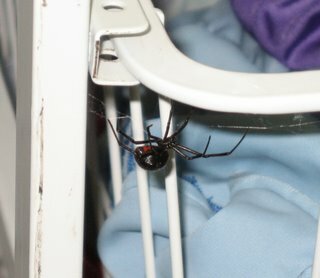 As I was getting ready to go to bed last night, I noticed a huge spider (2 inches in diameter?) in the middle of my bedroom floor. The encounter with the black widow really set me back in terms of my arachnophobia and I've ended up calling my dad to come to the rescue twice since then. That's a very high number of large spiders compared to the previous two winters here. This time I was determined to handle it myself. It was time to transform into Lenore the Spider Killer. I quickly determined that using a plunger was not an effective way to smash a spider and it got away. Next, I decided to try using one of my reachers (or "arm things" as I like to call them) and that was much more accurate, but it still got away and crawled under my secretary desk. I whipped out my LED flashlight and looked underneath the desk from my bathroom. From there, I could actually see its eyes, glowing blue. 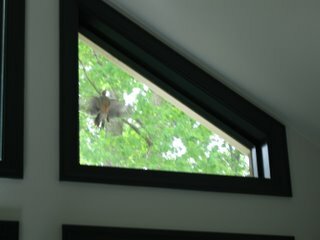 I got my binoculars from the great room and then looked again from my bathroom. Combined with the light from the flashlight, I could see it really well. Eventually it crawled behind one of the legs of the desk, so I wasn't sure where it was exactly. I waited, because I knew I would have a hard time sleeping knowing it was there. Approximately 22 minutes later, it crawled out into the room. I was fast enough and accurate enough with the reacher that time. Today my parents picked up take-out sushi from Kurama. As always, that was wonderful. 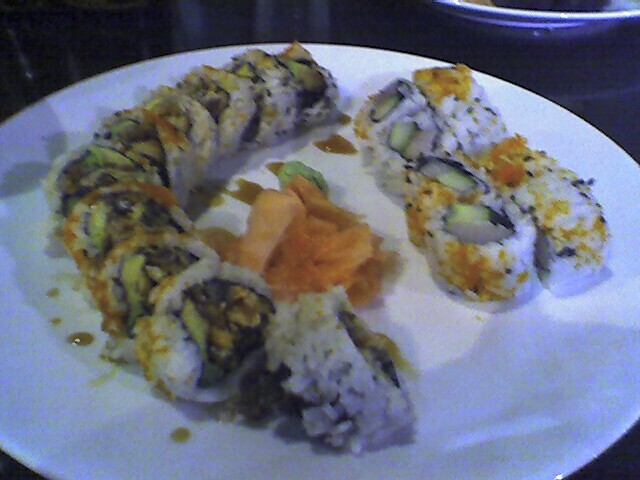 Kurama still has the best sushi in the area, in my opinion. AE and I went to Shanghai for dinner. We had soup, steamed pork dumplings and shared an order of ma po tofu. I was actually somewhat disappointed in the ma po tofu, because I think that Eastern Lights's version is far better. Fortunately, I was already pretty full from the soup and the dumplings. We went to Kroger afterwards and I resisted buying a DVD of the Princess Bride for $10. That's another movie that I've probably seen ten times and not in the last decade, but I figure I can always get it from NetFlix if I feel like it. 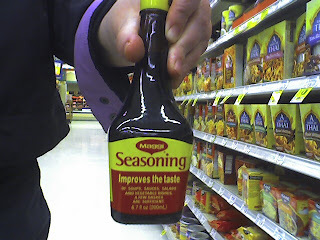 AE also found a bottle of "Seasoning" that we thought was amusing. I would like to wish all of my dear readers and their loved ones a Happy Secular Winter Holiday. I hope you are enjoying some sort of respite from your hectic lives and have relished the smidgen of extra daylight that we have already received. 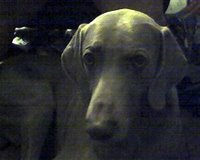 I started this blog three years and one day ago. I'm not sure I really believed that I would still be writing in it and I certainly have made fewer posts in 2006 than in previous years. I, however, am glad that I've kept it up as well as I have. I've continued to have a good break. I had lunch with DS and AE at Nosh on Saturday and then went furniture shopping consulting afterwards. I think I like shopping more when I'm not the one making the decisions. At Nosh, I had Piper's patties, which were effectively little omelette's. I'm not sure whether I would order it again. I think their Rocket Breakfast or Mike's Slammer breakfast is much better. It tasted good, though, so I just might not have been in the right mood for it. Yesterday, the 24th, my parents started working on straightening the tree and I left to pick up AE. We also picked up two SRP pizzas (meat, blue cheese, cream cheese, mozarella and caramelized onions) from Nosh, substituting chicken for beef. Those were excellent. We spent the day decorating the tree. It's likely the nicest tree that my family has ever had. It's certainly the largest, since it's nine feet tall. For dinner, we had shrimp, lettuce with balsamic vinaigrette and crackers. I tried out the mango horseradish sauce that I bought at A Southern Season. I didn't really like it that much, unfortunately. I may try mixing it with something else, as is suggested on the label. We also tried out a bottle of wine that I got from FW, who owns Creek Side Winery, in Elon. I just tasted it, but I thought it was delicious. My parents and AE seemed to agree. Next, my dad lit the candles and we started playing the Bach's Christmas Oratorio CD. 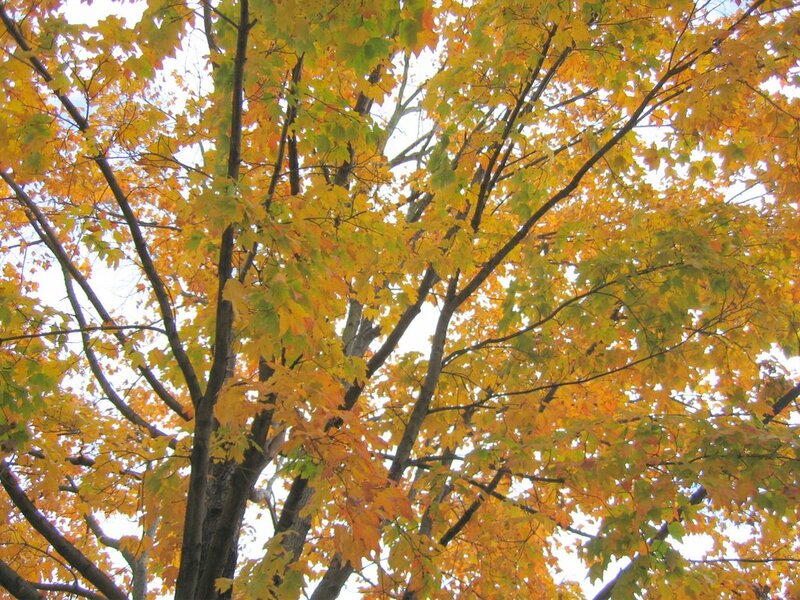 I took lots of pictures of the tree, as always. I didn't take any more movies, because I figured I have enough of those. Finally, we opened presents. My parents primarily got stuff from my Amazon wishlist. I have such good taste. This morning, my Dad came over and we made crepe pancakes. I haven't been baking enough recently. I didn't even immediately recall where I keep the flour! The pancakes were lovely, though. For AE's present, I told her that I'd make her three pairs of earrings picked out from my design notebooks. I used to draw every earring that I made and keep track of how well each design sold. She did that and then picked out the beads that she wanted. I made one of the pairs and I'll be making the other two soon. I made rolls. I'm not sure, but it's possible that I hadn't done that since last January. I should do it more often, because they are so good. My mom brought over the turkey breast, dressing and cranberry sauce. She also made gravy and green beans here, so we had quite a feast. Before and after dinner, AE and I watched the movie, Harriet the Spy. I read the book when I was 7 or 8. While I didn't remember much from the book, it seemed to be a good portrayal. I should be cleaning the house, so I don't know why I'm writing now. Actually, that's probably exactly why I'm writing now. At least the stove doesn't have mail on it anymore. 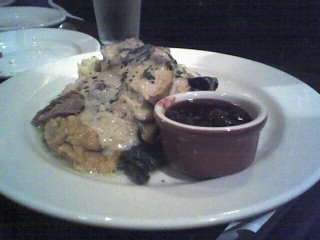 Last Sunday, I went to Brasa to celebrate DS's birthday. I'd never been to a Brazillian steakhouse before. They have an appetizer bar with lots of random food, including things like raw oysters and fried bananas. They also have people wandering around with skewers serving various kinds of meat directly at the table. Since I still don't eat beef, I was pleased that they also had pork sausage, pork ribs, pork loin, chicken, cinnamon coated pineapple and chicken hearts. I neglected to sample the chicken hearts and probably will have that flavor remain unknown to me for a good long while. It was hot at the office on Monday. They are doing some sort of maintenance and the early warnings indicated that it would actually be cooler than usual instead of hot. Apparently it was cooler in some parts of the building, but it was 80F in our cubical area. Fortunately, several of us escaped to the Macaroni Grill. I had lobster ravioli, which is the same thing I ordered almost exactly a year ago when we were there commemorating NW's departure. That night, my parents and I watched Four Weddings and a Funeral and I enjoyed it. Hugh Grant looked a lot younger over 12 years ago. I guess I did, too. It was was very hot at the office again. The Duke University Library Staff Association put on its annual holiday party in the Gothic Reading Room. The food was catered by Ole NC Bar-B-Que and was actually pretty good. People were supposed to bring in desserts. A bunch of us had a good time trying to figure out a long list of Christmas carols from a list of their acronyms. Tuesday night, I met AE, JH, AH and KD at Chai's. I had chicken pad thai and that was good. 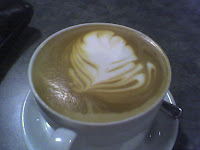 AE and I went to Shade Tree Coffee afterwards. They were out of decaf espresso beans, so I had the opportunity to discover that their drip coffee is very good. Wednesday was hot at the office, but not quite as hot as previous days. It was only 77F. I escaped once again and had lunch with NP at Thai Cafe. We shared some Thai Cafe Baskets and I had an order of chicken massaman with spicy coconut soup. As always, the food was superb. Since it was lunchtime, I also got to order Thai Iced Tea, since I didn't have to worry about the caffeine's keeping me awake. Wednesday night, I had dinner with my parents at the Flying Fish. They were out of oysters! I tried their ceviche and got a side order of fries. That was an enormous amount of food. Either the fries or the ceviche would have been more than I could have eaten for a meal. 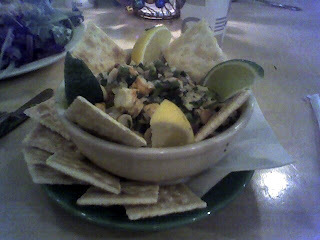 The ceviche was very good, but it wasn't nearly as good as HC's. Yesterday, I went to a Staff Development Committee meeting and then had lunch with DS at the Loop. I got to show him around the office afterwards. I don't know for sure, but I suspect that my cube decorations are more of a shock to those who have seen how I decorate my home. It's completely different, although I seem to be accumulating more stuff around the house as more boxes of my grandmother's knickknacks get unpacked. Last night, I went to JJ and JA's for guitar practice. That was fun, as always. We decided to see if we could get a table at Grasshopper, since it was a Thursday. We did. We shared some really delicious calamari as an appetizer. It was sliced very thin and was just perfect. We also shared fried pork dumplings and fresh spring rolls. For my entree, I had an order of bun with hanging roast pork. 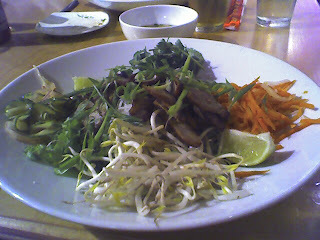 It was very similar to the vermicelli dish I had the Kim Son Vietnamese restaurant a couple of weeks ago, but the meat was far better at Grasshopper. I probably like the pickled vegetables and noodles better at Kim Son, but this was very good, too. I had today off from work, so my parents and I went to the Flying Fish for lunch since we knew another oyster shipment should have come in. Afterwards, we all went to Catherine Callaway's to pick out some earrings. It was nice having a longer chat with her and it was nice to see she was very busy with customers. I used to hang out in her shop quite a bit when I was a teenager and she inspired me more than anyone else to start making jewelry. Tonight I cooked dinner for my dad. I made my usual shrimp pasta with bacon and garlic. He was supposed to bring a bottle of wine with him, suitable to use as cooking wine, but he had forgotten. As an experiment, I decided to use beer instead. I used most of a bottle of Corona and he drank the rest. I also added a bit of ginger to my basil and chives mixture. It turned out well. I still prefer using wine, but it was a decent substitute. Yesterday, our Blackboard Tech team met with the UNC Blackboard team at Nantucket Cafe. It was fun commiserating. I had only been there once for lunch before and I finally got to try their lobster, bacon and scallion quiche, which I had with a side salad. 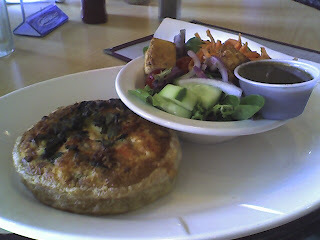 I felt as if I'd been spoiled by all the Refectory quiches, which are light in comparison. The Nantucket quiche was good, but way too rich. It had a croissant-like crust, which, again, was good, but was a little over the top. I was glad that I hadn't foolishly paired the quiche with a bowl of lobster bisque, no matter how good it it is. 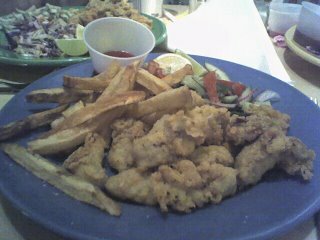 Guitar practice was cancelled, so I made yet another trip to the Flying Fish with my parents. This time I got a Flying Mayan burrito, which contained black beans, sweet potatoes and avocado. I am not a fan of sweet potatoes, but it added a nice touch to the burrito. Today, I went to the Forest at Duke to see AE play in the Durham Community Concert Band. It was hard to believe that it had been well over a year since I'd seen them play. I know two other members, TL, a ham radio operator, and RG, from the library. I enjoyed the music quite a bit and I was actually able to see AE play her French horn, because she was on the front row of the horn section and I was on the front row of the audience. Afterwards, AE and I went to Target and I was able to get a whole bunch of Annie Chun's noodle bowls. According to the link, I could actually buy them online for less, with free shipping, if I wanted to buy them in bulk. Tonight, I went to a party at CV's house. I had a very good time and the food was good. I managed to only make one wrong turn on the way there, after I actually entered the development. I made no fewer than four wrong turns on the way back. I am so talented. I recovered very quickly in all cases, though, because it was easy to find places to turn around. I think it's actually easier to find one's way around this time of year, because it's easy to determine if you've been down a road before, due to all the Christmas lights. Today was a relatively good day. First, HC brought in chocolates that AC made. They were truffles made with cayenne pepper, ginger and Grand Marinier. I ate two. I could have eaten many more and I usually only eat large quantities of dark chocolate covered orange peel. The truffles were my idea of a delicious and nutritious breakfast. HC, CV, SM and I went to the Refectory for lunch, which was fun. I had black beans and rice, which is always good. I went to my parents' for dinner and visited with FIFO. I swear he acts happier to see me every single time I go. Hopefully, the greeting ceremony won't get too much more dangerous. When I got back, I had a package from Amazon waiting for me. It was from my brother! That was very exciting, indeed. He got me four CDs from my wish list, Die Prinzen, Die Aertze, an Eagle's Greatest Hits and the Thompson Twins. The first two were ones that I listened to when I took German in college. I understood almost all of the lyrics back then. Now I can appreciate the actual music more. Tonight I went to the Orange County Radio Amateurs annual Christmas party. 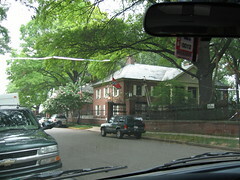 This year it was held at the new Mayflower, in Hillsborough. 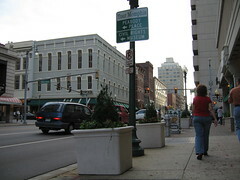 Various seafood restaurants have occupied the building over the years, after the Western Sizzlin went out of business. None of them have been particularly good. I decided to get a combination fried oyster and baby flounder platter. I figured I could eat the flouder and would have more than enough food if the oysters weren't good. They weren't great, but they were better than the ones at the Mayflower in Durham. The baby flounder was pretty good. I also picked green beans as my side, because I think it's virtually impossible to destroy them. I like them equally, regardless of whether they are barely cooked or barely recognizable. It was good to see everyone. I don't go to their meetings regularly so I don't get to see many of them as often. I used to be more social and would go to the Saturday morning OCRA breakfast, but I haven't done that much at all since I started working at Duke. It's just too early in the morning and I'm too tempted to eat extremely unhealthy food. One of the people I met for the first time tonight was one of my closest neighbors, GJ. That was very cool. I've lived in this house for about 2 1/2 years and had only seen him from a distance. Of course, I've lived within a few hundred feet of here for 17 years, which makes it even more remarkable. He recently became an amateur radio operator and has been checking into the Durham FM Association Thursday Night Nets, which I check into almost every Thursday, if I remember. I would imagine that it used to be more common to meet neighbors this way back when there were more hams, but maybe not ones that live so close. 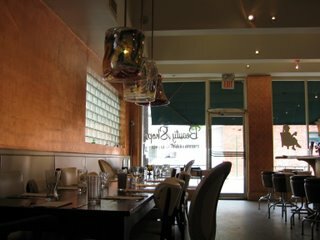 I forgot to mention that on Sunday, I had brunch with AE at Nosh. They had a special that replaced the biscuit in the Rocket Breakfast with a giant fluffy pancake. It was a very good pancake. One amazing thing is that just as I was leaving, I ran into KY (now KE) for the first time since graduation. She just moved back here last week and looked exactly the same as she did six years ago. I guess six years wasn't that long ago. I forgot to mention at least two things in my last post. My parents and I watched An Inconvenient Truth on Sunday. I thought it was extremely well done. It wasn't as depressing as I'd feared, but I also didn't see it as uplifting either. It's good that it's not depressing, because that would lead to fewer people watching it. One sad aspect is thinking that we were watching the guy that could have been our president. The world would have been a very different place. Of course, I might have had a similar reaction had I been watching a Barney video. Almost any entity, animate or not, would be better than what we have. One of the more disturbing things to me were the photos of glaciers that have receded or almost disappeared completely. I kind of hope they weren't paying attention to the seasons when they were making the comparisons, but I suspect they were. I guess it all makes me wonder just how much damage we have to do to the earth and just how many peoples lives have to be directly impacted adversely by the resulting changes for enough people to do something that will really make a big impact. I say big impact because I know that every hybrid car, every solar panel and every recycled French fry makes a difference. I can't remember what the other thing that I forgot was. Oh yes, when we went to Kim Son on Friday night, we had deep fried bananas and ice cream for dessert. I think I've determined for certain that I only dislike raw bananas. If they are well cooked, I like them. I don't think they are cooked enough in banana pudding and I suspect this is due to some sort of allergy. Tonight the Durham FM Association had its annual Christmas party, which included a white elephant gift exchange. I'd never participated in one of those before and it was surprisingly fun. I ended up with a 12' tape measure, by choice. My dad ended up with a 100' tape measure by choice. Some things definitely tend to run in families. About 40 of us ate dinner that was catered by the Shrimp Boat and it was pretty good. It was definitely better than last year for some reason. JH joined us for dinner, which made it even more fun. Last Wednesday, AN and I went to Mt. Fuji for dinner. We had a lovely dinner and were entertained by D, who accused me of having locked up my parents, since this was actually the second time that he'd seen me without them. 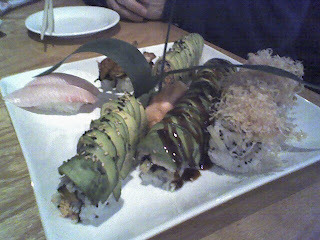 I thought our caterpillar roll was definitely the best, although one of the things we had was a salmon skin roll, which I'd never tried before. That was good and the pieces held together better than the ones from other rolls, which I appreciated a great deal. 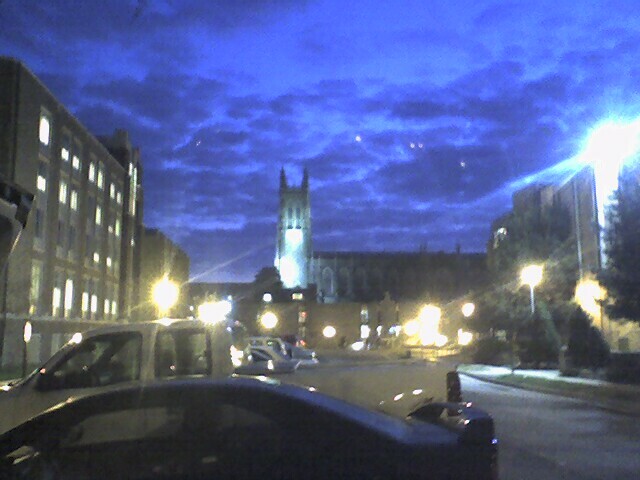 Next, AN and I went to see the Duke Symphony Orchestra, which performed works by Mozart and Shostakovich. The Shostakovich, in particular, was very impressive. We got to chat with AE some before and afterwards. Thursday was my birthday. 31 doesn't seem like a big deal to me after 30 and 29. 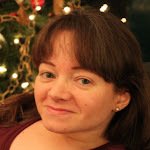 29 seemed like the "worst" to me, in terms of aging anxiety. I actually ate lunch by myself at the Refectory, because NP was too sick to join me. Although I was sorry he was sick and missed his company, I enjoyed people watching while eating a giant piece of quiche and a bowl of fruit. I had dinner with a bunch of friends at ACME Food & Beverage Co., which was a lot of fun. I had my usual fried oyster salad with the bourbon bacon vinaigrette. They brought out the chocolate terrine with a candle while everyone sang "happy birthday", which was very nice. I really wanted the rice pudding with brandied cherries and caramel sauce, so I ordered that, too. Friday, we had guitar practice. JJ tried playing the penny whistle, which KD gave me, while we played Long Black Veil. The penny whistle is in D and, so far, that is the only song that we play in D. That also just happens to be the only song where I do the majority of the singing. We just need to learn more songs and I need to practice more. For dinner we all went to, Kim Son, a Vietnamese restaurant. I hadn't been there in at least five years and I was happy to go back. I was very pleased to see that they had added a ramp since my last visit, too. 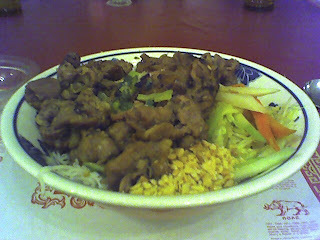 I had grilled pork with vermicelli and pickled vegetables. I enjoyed it quite a bit. Saturday, AE and I went to A Southern Season and went shopping. I mostly bought chocolate and tea. I also found a mango horseradish seafood dipping sauce that I wanted to try. One of the things I got was "Red Fire" dark chocolate with cinnamon and hot chilli peppers, made by Vosges. It is surprisingly good. It's not very hot, but it has a little kick to it. I tried the Dragon Pearl Jasmine today and it was really quite wonderful. It comes in silk sachets and the tea leaves are bunched up into pea sized balls that slowly unfurl in the hot water. It smells just like jasmine flowers, which seems very unusual for a beverage of any sort. We had dinner at the Weathervane, which part of A Southern Season. I had lobster ravioli, which I thoroughly enjoyed. It was well seasoned, but extremely mild. 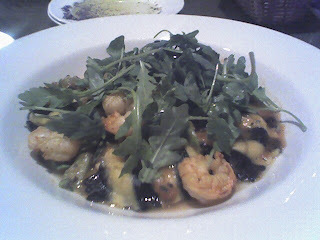 It was light and not creamy, unlike many lobster ravioli dishes I've had in the past. Finally, we went to the Deep Dish theatre and saw a performance by Fat Mouth Improv. That was a fun experience, because one of the group's members is my boss, NC. I'd never seen improv before, so I had no idea what to expect, but it was a lot of fun. Some of their fast scene changes would have been impressive even if they had been planned out verbatim and it was awesome to see an plot emerge in the long form improvisation. It was very funny, too. It's just not every day that one can see one's boss take a scary flying leap across a stage in order to catch an imaginary frisbee or act as if he were pole dancing. Sunday, I went with my parents to Mt. Fuji again, just to prove to D that I did, indeed, let my parents leave the grounds now and then. 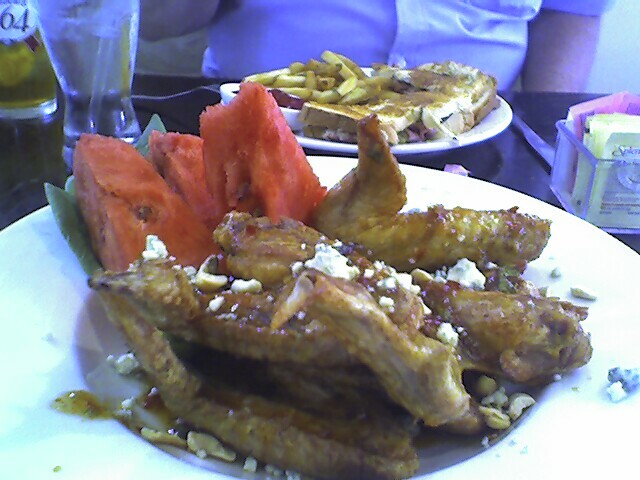 Last Saturday, GM and I picked up AE and we went to Taverna Nikos for dinner. Not long after we arrived, I received my first text message from an actual human being. I'm surprised it's taken that long considering I have a phone with a qwerty keyboard. My parents got them from my brother years ago. Then again, it's not as if I've sent them to anyone. I ate shrimps and scallops in a lemon cream sauce over penne pasta.. 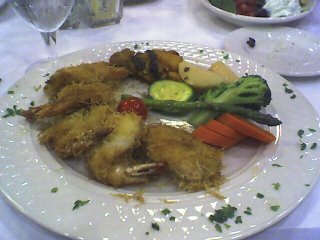 The shrimp were absolutely perfect. As I suspected, I discovered that my new fondness for scallops is not all inclusive. I don't know if it's the type of scallops or the degree to which they are cooked, but I wasn't as enthused about these. Fortunately, the rest of the food was more than I could eat. 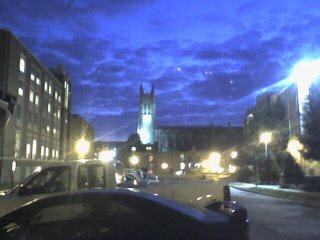 After dinner, we all went to see the Bulgarian Women's Chorus at Duke's Page Auditorium. Like almost everything I've seen there, this was part of my family's season tickets to the Duke Artists' Series. We had to work harder at finding a parking space in the Bryan Center parking garage, because there was also a men's basketball game at the same time. The choir appeared first in flowered white dresses with their hair completely covered in white cloth. They sang folk songs with unusual tempos and harmonies. Some songs were comical when in a repeated phrase they would enthusiastically say "boop!". Of course, we had no idea what they were singing about, because there were no translations provided. After the intermission, they wore black dresses without head coverings. Strangely enough, that made them look almost as if they were completely different people. The next morning I went to the late service of the church that GM attended when he lived in Durham, Blacknall Memorial Presbyterian. I went to hear GM play the oboe with their orchestra and their large choir. They played Vivaldi's Magnificat, several hyms and carols. I hadn't attended a church service since I was 12 or 13, so it was an unusual experience for me. I explained to several people, who welcomed me, that I was there to hear the music. Afterwards, GM and I met up with AE, JH and P at Madhatter's. I had a eggs benedict and a latte. The eggs were superb and not overcooked, like they were the last I was there. AE and I went in WholeFoods for a bit and GM headed back to his new home in Charleston. As soon as I got home, my parents and I watched the movie, the Constant Gardener. Flashbacks in the story made it a little confusing at first, but I thought it was a very good movie about evil drug companies. It was written by Le Carre, so it's not surprising that it had a good plot. That night, I went over to JJ and JA's to play music. We spent a lot of time working on Jingle Bells, which was fun. JJ picked up Chinese food from Shanghai. After dinner, we watched the Christmas Story, which I hadn't seen in about 20 years. Yesterday, I went back on support, so things at work were somewhat more mentally hectic than they were for the previous three days of coding/investigation. I had lunch with NP (and briefly CB) at the Refectory. I ate quiche, a small salad and a popover, which was similar to the quiche, but fluffier. NP was recommending strategies for keeping a cat from getting outside if I were to get a kitten, which he strongly recommended. We argued somewhat over whether my hypothetical kitten should be male or female. I was arguing that I'd rather get a male, based on the personalities of male cats I've had. He was arguing for a female since females would be less rambunctious and less likely to try to leave the house. I recently told a friend that her dog is welcome to stay in my house whenever she comes to visit, so for this and many other reasons I think this discussion was completely academic for the time being, despite the fact that there's a large mouse living in my garage. I don't claim to understand why I dislike the idea of standard mousetraps, but a cat's playful rodent torture doesn't seem so bad. I, however, would rather not be a witness to either. Last night I met AE, KD, GM, DS, JB, JH and KR for dinner at Chai's. GM is visiting from Charleston for the first time since late July, so it's been great to see him. I actually hadn't seen JB in the same length of time, so I was finally able to give him a well traveled stuffed frog for LB, which had been living in my van for a good while. 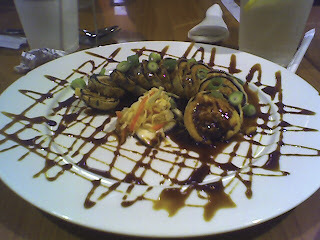 I had a chicken walnut roll, which was quite good. We went to Shade Tree Coffee afterwards. Overall, I had a splendid time. This morning I ordered Billy Joel concert tickets. What was interesting is that there didn't seem to be a way to specify that I wanted accessible seats. Maybe I just missed it somewhere, but the only way to get them that I saw was to check the box indicating that I couldn't see letters in the CAPTCHA. Then it suggested that perhaps if I can't see it, I might want accessible seating. That's completely bizarre! Fortunately, I got the seats that I wanted and they weren't horribly expensive compared to when I saw Billy Joel and Elton John a few years ago. I think I will take this opportunity to tell the world that I have felt lousy (read: pitiful) all day. I feel as if I'm coming down with some sort of common illness. I had a bad sore throat when I woke up this morning and I've had a mild one for the rest of the day. So far it hasn't prevented my going into work at all, which isn't saying much. Hopefully I will remember not to mention this again in great detail when I finally catch up to now in my chronological saga. I added Adsense Google ads this evening. It's more out of curiosity than anything else, because I'd kind of like to know what sort of ads it will put next to my posts about food and guitar practice. It will display a public service announcement for the next day or two, until they decide that I'm worthy. Until then, this post was sponsored in part by the generic versions of Claritin and Sudafed. The next morning in Arkansas, we briefly had breakfast downstairs at the hotel. Then we had the pleasure of changing rooms. The ordinary rooms weren't nearly as nice as the Presidential Suite, so I guess you actually get something for the price difference of $270 or so. 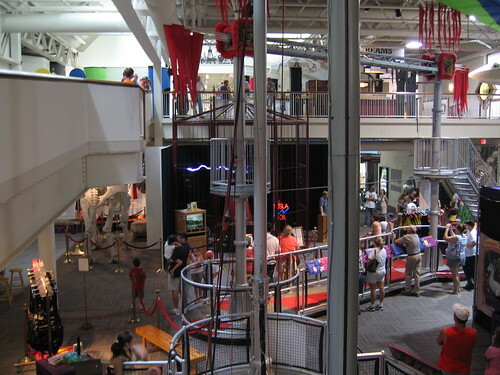 Then we met everyone who could wake up early enough to meet us downstairs and headed for the Mid America Science Museum, which was pretty impressive. It is a Smithsonian affiliate and each year they have a different theme. This year's theme is the circus. It was actually one of the nicest science museums I've seen. 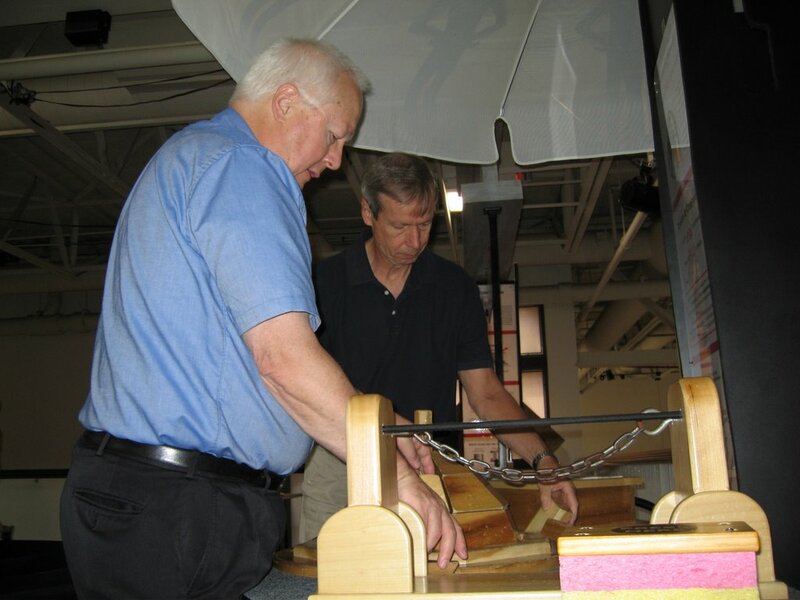 Below you can see my dad and his little brother (my uncle) playing with blocks. 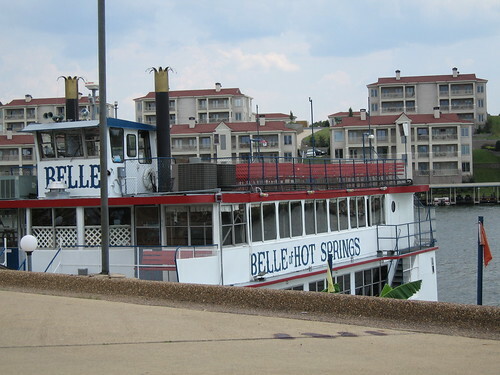 After leaving the museum, we drove over to Lake Hamilton and took a cruise on the Belle, a riverboat. Getting on the boat was more than a little nerve wracking, because they had had a metal flap that came down for a ramp. Since the lake level was on the low side, the angle was 75-80 degrees. Fortunately, one of the ship's crew clearly knew what he was doing and got me down more easily than I expected and before I could argue against it. My dad and I had to sit on the first level, because there was a flight of steps up to where everyone else sat. Later on in the cruise, several other family members came down to visit. We were served a sandwich with ham, turkey and American cheese on a croissant with a dollop of potato salad. The cruise itself was very nice. We got to see all of the ritzy houses along the shore of Lake Hamilton and hear more of the history of Hot Springs. I was nervous about getting off the boat, but that was actually somewhat easier. The morning after we arrived in Arkansas (Bastille Day), my dad and I had breakfast at the hotel with my dad's cousin, UB, and her husband, RB. 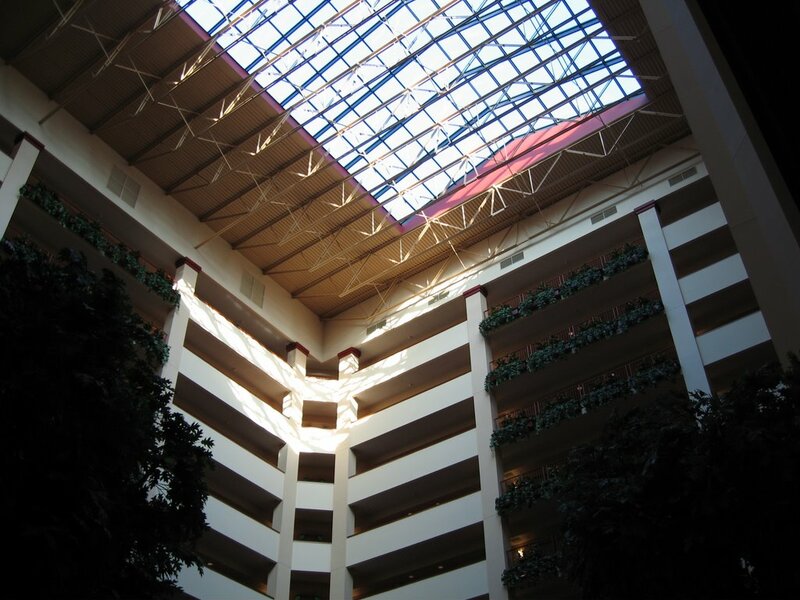 The Embassy Suites definitely had the best breakfasts of any of the hotels where we stayed. It was a full complimentary breakfast buffet and you could pretty much get anything you wanted. I fondly remembered some of the Tivoli quarterly company breakfasts that we had at the one in Cary when I first started working for IBM. I hadn't seen UB and RB in 14 years, so it was great to spend time with them that morning and throughout the reunion. Once my uncle, WR, his wife, BR, and my two cousins, NR and MR, arrived, we all had lunch at the hotel. I actually don't remember what I ate. Imagine that! My dad's cousin, HR, and his wife, SH, arrived late that afternoon. The hotel had cheap ($1) drinks at the bar every evening, so we all took advantage of that. I got them to make a nice fruit juice and soda water concoction. UB's daughter, BO, and her husband, MS, arrived. Finally, UB's son, CO, his wife, JO, and their kids, ACO and ARO arrived. I'm sure the initials are confusing, but hopefully it will be useful for the next few posts. Next we had dinner at the hotel. 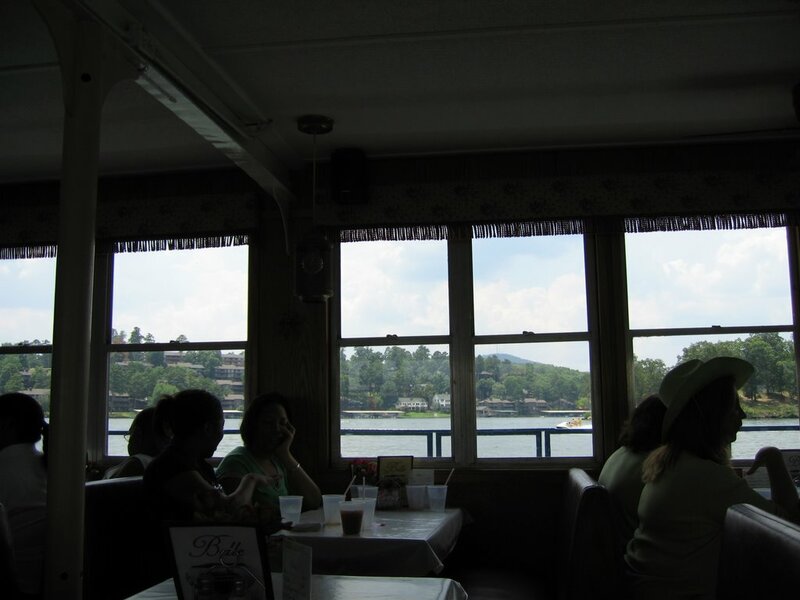 Each meal took several hours, because the service was extremely slow, but we were in no hurry. After days of traveling, it was nice to take a break from driving and chat. After dinner, almost everyone went up to our suite. 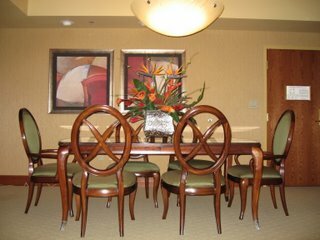 We got to show off all the luxury and hang out in our dining room. We all looked at the photocopies of the old photographs that I had been sorting and people marked their initials next photos if they wanted copies. I've been working on scanning them and I need to spend more time on it. HR and SH brought wine, so we all had a grand time. Take a look at the faucet on the whirlpool. 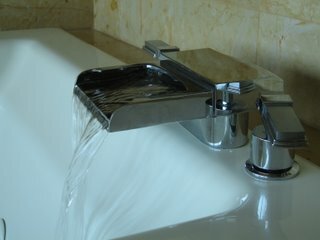 I would imagine that it would take forever to fill a whirlpool tub of the size that was in our suite without a fancy faucet, such as this one, but I still thought it was cool. 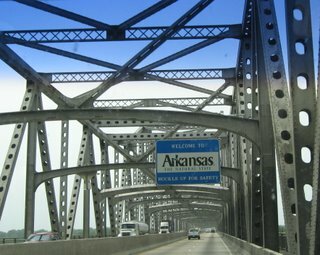 After we left the National Ornamental Metal Museum, we briefly got lost and then drove over the I-55 bridge and crossed into Arkansas. Yes, you did see that bridge in the pictures taken from the museum. 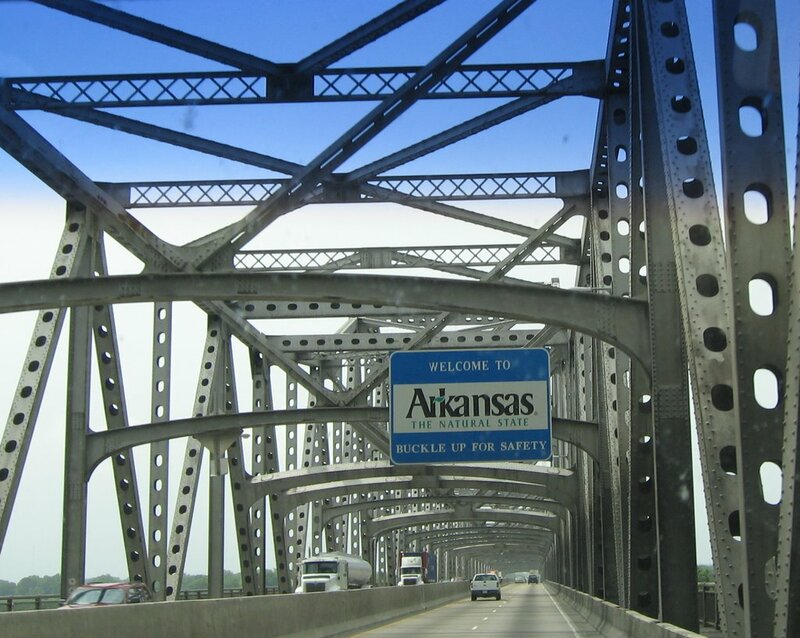 Arkansas was a new state for me, so that was pretty exciting. When we crossed the Mississippi, the land was extremely flat. It was flatter than any land I could recall, but it had been approximately 25 years since I'd been to Indiana so I may have just forgotten how flat that was. It looked as if much of the land was taken over by agribusiness and they were mostly growing a lot of short leafy green things. As we got closer to Little Rock, the terrain was reminiscent of the Piedmont of North Carolina. By the time we arrived in Hot Springs, we were in the mountains again! It was definitely a remarkable transition in just a few hours. When we checked into the hotel, the Embassy Suites in Hot Springs, they said that for two nights there was a problem with our room. We would have to stay in the Presidential Suite. Goodness. That was certainly an imposition. We had a huge living room, a kitchen, a dining area and two bathrooms. The gorgeous master bath had both a huge whirlpool tub and a large shower. The room was on the ninth floor and every room had beautiful views. The bedroom even had a telescope. 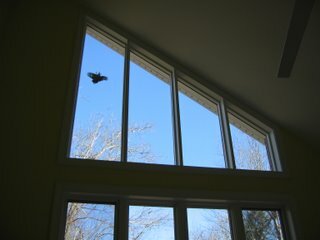 I never did ask about the square footage, but it seemed almost as big as my house. Plus it was decorated with pottery, flower arrangements and candles. 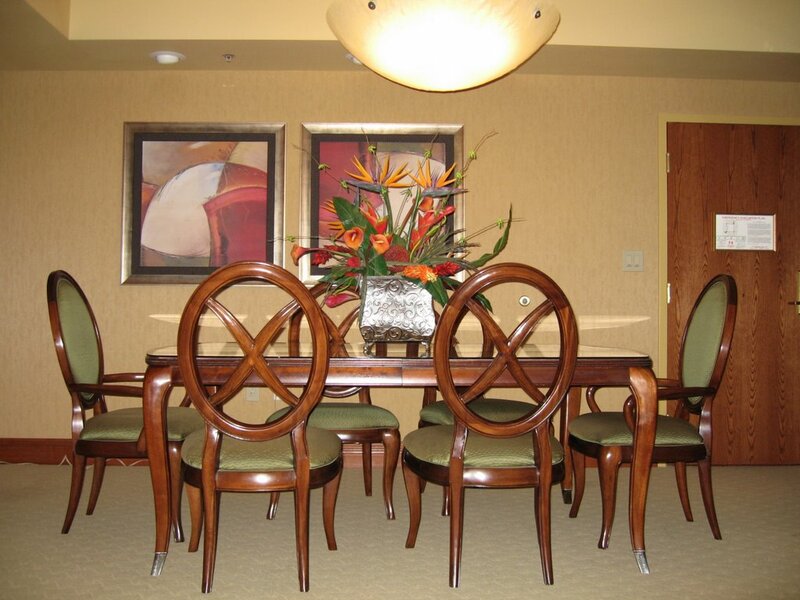 Once we'd settled in a bit, we went downstairs for the first of many meals in the hotel dining room. I had white bean chili and decent bread pudding for dessert. 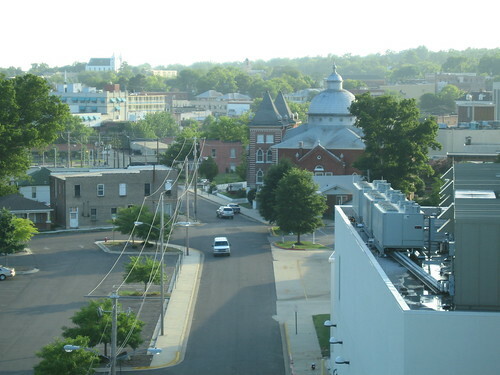 Below is the view of downtown Hot Springs from our hotel rooms. I apologize to those of you who read my blog via the atom feed, because you've been seeing a lot of old posts listed. If you haven't guessed, that's because I am trying to tag all of my old posts. Hopefully that will make it easier when you all want to go back and read things I've said in certain categories. Of course, if you try looking at the posts tagged with "food", then you might as well just read the whole blog. It's actually been fun reading through my old posts, because my style has really changed. I miss writing about what is actually on my mind while I'm writing, so I may try to do that more. Hopefully I'll actually catch up someday, but I also don't want to leave out any of the gory tales of my adventures. 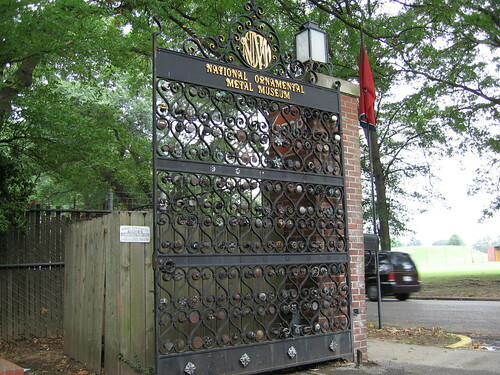 Following the excellent lunch at the Beauty Shop, my dad and I headed back toward the river to see if we could find the National Ornamental Metal Museum. We ended up getting severely lost. If I haven't mentioned this before, I have to convey that the combination of my and dad's attempts to navigate in an unfamiliar area are truly comical. Of course, countless people can tell you that my attempts to navigate in a familiar area are comical as well, but it's usually on a much smaller scale and I don't confuse north and south quite as often as a I did a few years ago. Eventually, we actually found it. By then, it appeared that we would have a thunderstorm, so Dad went inside to check it out, before I even left the van. The buildings were quite dilapidated and there was even one guy on a ladder fixing the roof. 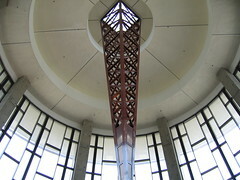 It wasn't really what I expected for a "National Museum", but it was rather cool. 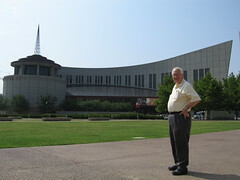 When Dad returned with positive news, we headed across the street and inside. The lady at the front desk gave us an umbrella and recommended that we go out again to take a look at their view of the river, before it started raining. 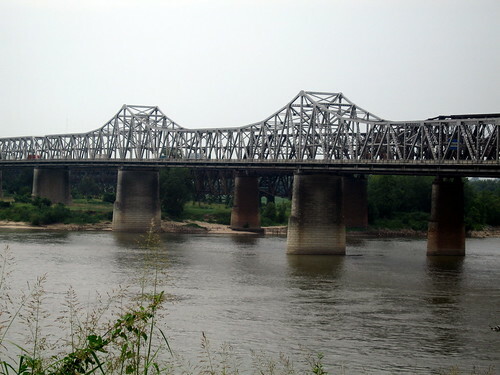 We weren't disappointed in the view, in the least, because the view was even better than the one at Tom Lee Park and were very close to the I-55 bridge. We also got to see a boat pushing a huge barge down the river, which I'd never seen before. A barge would get more than a little stuck in the Eno River. I'm betting canoes get stuck sometimes. 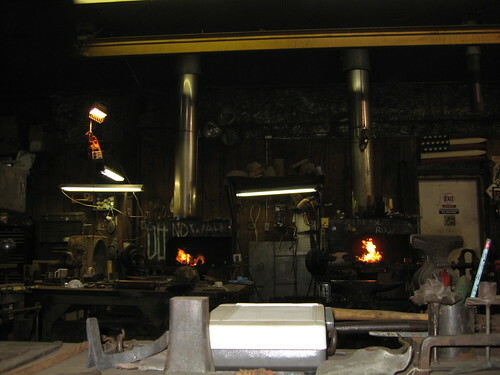 Next we went to their blacksmithing forge. That was pretty nifty. We got the impression that they were more artists than people doing production work. They were working on building a sarcophagus for a blacksmithing friend who had recently passed away. Finally, we went to the actual museum. They had lots of what I would describe as small sculptures made of gold and fine silver. 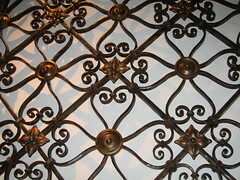 They also had old gates and other decorative, but functional, work. I managed to resist buying earrings in their gift shop. They seemed very proud of their entry gate and I photographed it as we were leaving. An amateur radio operator had seen my license plate and left a note on my windshield while I was at the museum. It was nice to have a greeting from a fellow ham. Our next morning in Memphis, we set out to get the tire fixed at a tire place that the hotel recommended. We headed down the wrong street, but eventually discovered that the directions they gave us were from a different entrance. It turned out that the tire had a broken valve stem, which cost only $11 to fix! I had feared that it would be so much worse, but we were on our way in no time. Our next top was Tom Lee Park, to see the Mississippi River. 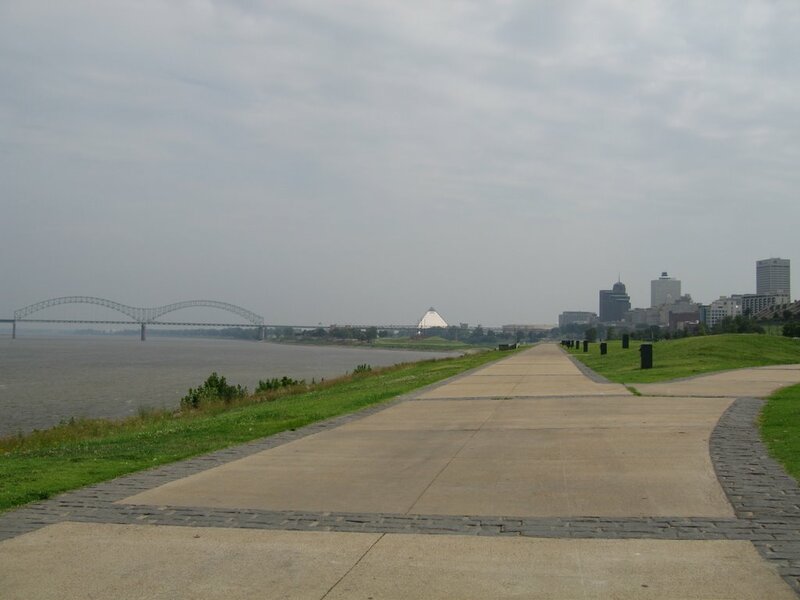 That was really cool because the park had these long flat sidewalks with a clear view of the river and the giant houses along the levee. The only downside was that it was extremely hot since there really wasn't any shade. In the photo, you can see the Mississippi River and the Interstate 40 bridge on the left, downtown Memphis on the right and the Pyramid Arena in between. 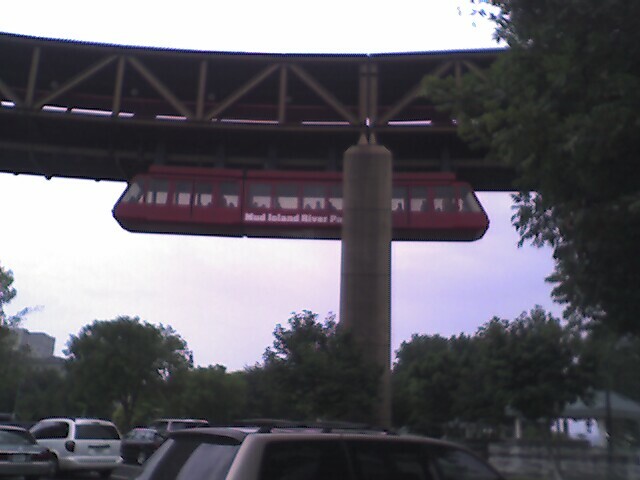 Next we looked at Mud Island River Park, but it was only easy to get to via overhead rail. It was cool looking, but I wasn't in the mood to explore that method of transportation, plus we didn't have much time to spend there. 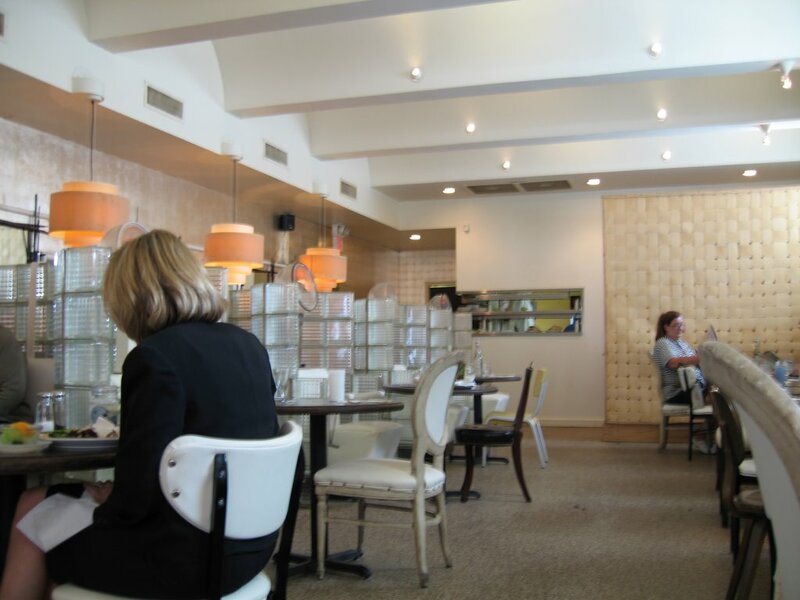 We drove across town, to Midtown, and ate at the Beauty Shop, which HB recommended. Basically, it's an eclectic restaurant in a building that used to be a beauty parlor. They used original furniture from the parlor, had mismatched silverware and glasses and added some very interesting art glass lamps. That was just the decor. The food was really quite good. I ordered whole fried chicken wings in a spicy sweet sauce with cashews, small chunks of bleu cheese and large pieces of watermelon. It was a great combination, but it was a lot of food. I wanted to try their desserts, but I just couldn't eat anymore. I would have loved to have also tried their savory crepes and several other dishes. 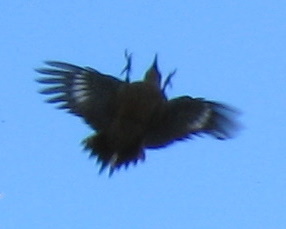 I have to interrupt the scintillating tale about my flat tire to let you all know that the Crazed Woodpecker is back. I hadn't seen him in about three months or more, but somewhere around the crack of dawn this morning, I heard him flinging himself into the great room windows. He's still at it. In other news, I received a tip from one of my dear readers that Pepsi Co has purchased Izze Soda. My initial thought was to cringe, because yet another giant company has swallowed a little one. They also might mess with the ingredients, such that it will be less healthy and delicious. The only good that can come out of this is that Izze will likely become more readily available and might (this is a stretch) be cheaper. I'm still cringing. The drive to Memphis was fairly uneventful, although we did run into an extremely heavy downpour. I literally couldn't see the car right in front of me. This was still not as noteworthy as our actual arrival in Memphis. 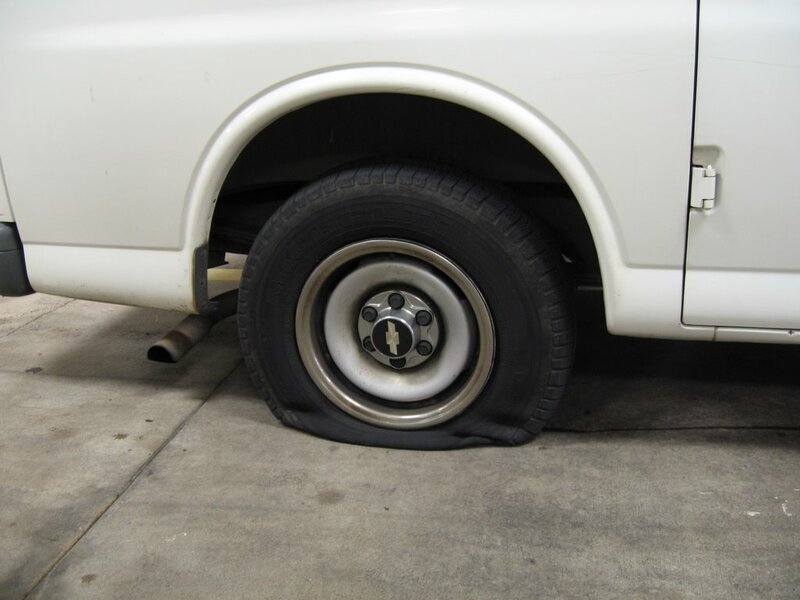 When we pulled into the parking garage of the Memphis Holiday Inn Select and I maneuvered into the parking space in their garage, they pointed out that our tire was aflat. Very flat. I was somewhat distressed, because HB had given me all these recommendations of what to do in Memphis and I figured that we might not get to do all of them. The people working at the hotel were extremely nice and put on the spare for me. 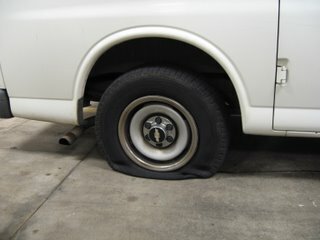 I then had to drive the van up to the third floor, up an extremely steep ramp, so they could pump some air in the spare. The spare was very low, so we were worried about the seal, but we made it. Overall, the hotel, the Holiday Inn Select, was very nice and was across the street from the famous Peabody hotel, where they have the ducks that march to their fountain at scheduled times. 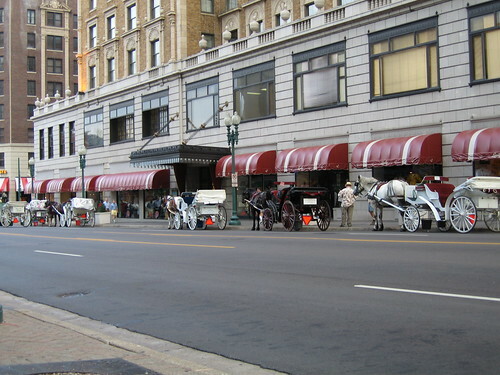 The Peabody looked cool from the outside and they had quite a collection of horse drawn carriages. The room in our hotel was not quite as spacious at the Hampton Inn room, but the service was just incredible. The bathroom was also nicer and more accessible. Since we weren't confident about wandering about on just the spare, we abandoned HB's dinner suggestion and decided to walk somewhere. We first went around the corner to Erika's German Restaurant, but that had closed. Then we went across the street, to Sawahdii, a Thai place. That was quite good. Unfortunately, I had attended the cocktail hour at the hotel and apparently ate more than I should have. 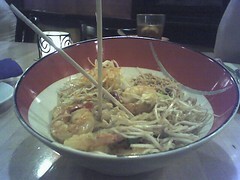 I couldn't come close to finishing my Pad Thai. I also had Tom Ka Ghai soup, which was excellent. One funny thing at the hotel was that one of the elevators refused to stop on our floor, the fifth floor. It reminded me of Grey 17 is Missing. The morning after my dad and I arrived in Nashville, we had breakfast at the hotel, which was ok. They had strange egg discs, which were surprisingly good. As we were leaving the hotel, I got a call from RR to say that she had her baby. That was an exciting way to start the day! 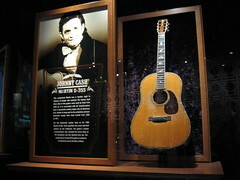 We visited the Country Music Hall of Fame and Museum. I thought it was pretty interesting thinking about what sort of things my ancestors would have listened to and the instruments they would have played. Plus, I'd heard the music of at least some of the musicians they featured there. I've never been a huge country music fan, but I am more likely to like the old stuff. Of course, the Joan Baez Country Music Album is one of my favorites. I took an inexplicable number of pictures while I was there. The lobby was one of the coolest things, from an aesthetic perspective. 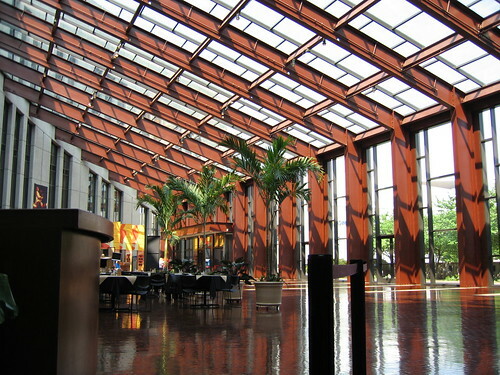 Another cool thing was the architecture of the room containing the Hall of Fame itself, particularly the ceiling. We had lunch at the cafe in the lobby area and David Andersen was playing guitar while people ate. He showed me a few things, both simple and complicated, and seemed extremely nice. We bought a CD and a book from him. My dad was most amused when he recognized a Bach piece, because he hadn't realized that Bach was a country musician. Andersen apparently will play just about anything that's requested, showing off incredible versatility. I had a fried green tomato BLT for lunch, which was pretty good.